How much fun are kid's birthday parties? .... I know, I know, there's a tonne of them to get to, and it's tricky to choose a present, especially when you're not all that familiar with the kid or their family, and, well, there's a tonne of them to get to ... but what I love is seeing how creative people are with their party ideas, and how excited the kids are to be invited. 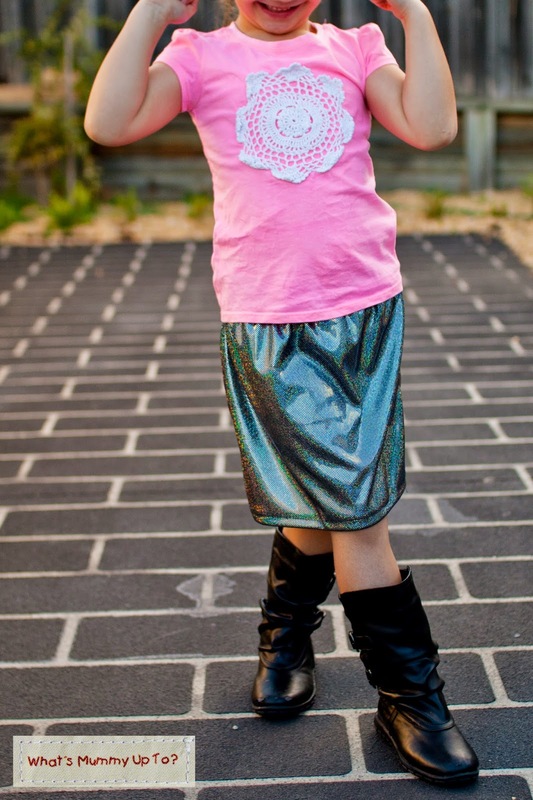 Bethany was recently invited to a little school friend's party and the theme was Disco! Ohhhhh .... I just couldn't resist .... so when Spotlight literally fell on top of me one day and forced me to buy fabric ... it's true, it really happened ... 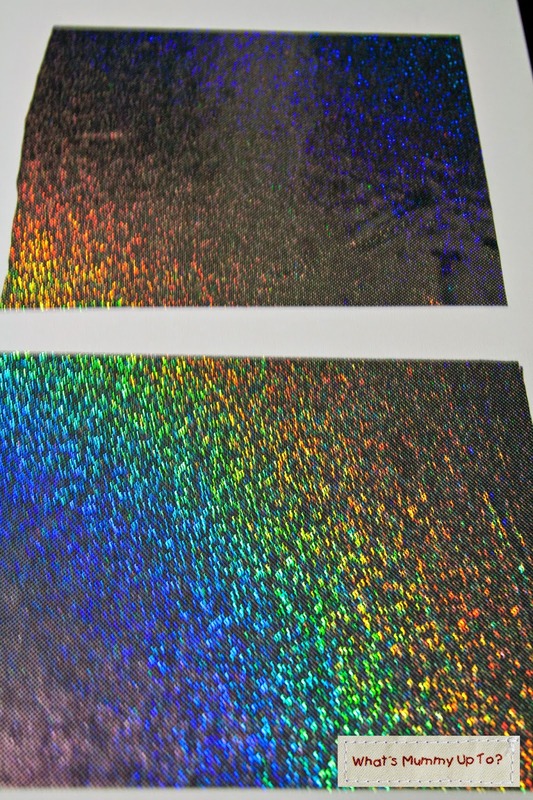 I went a-huntin' for some disco'esque fabric. I found this cute black and silver sparkly number in the "dance fabrics" section. 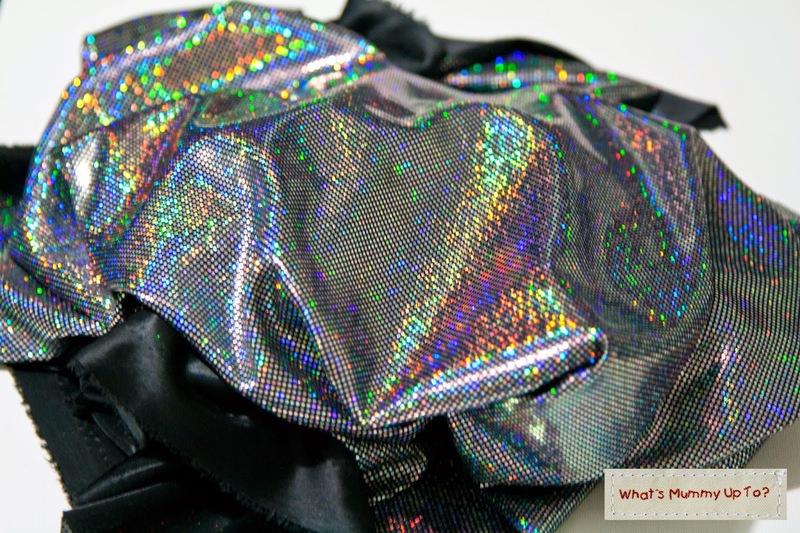 I'm not entirely sure what it is, to be honest, but it has a stretch in one direction, the sparkles are printed on one side, and the back is plain black ... it's Fairly light-weight and almost feels like lycra, but not as stretchy as that ... anyone know what it is? Anyway, I loved it and started designing a little skirt right there in my mind. I also grabbed some 1 1/2" wide black elastic, and off home I went. 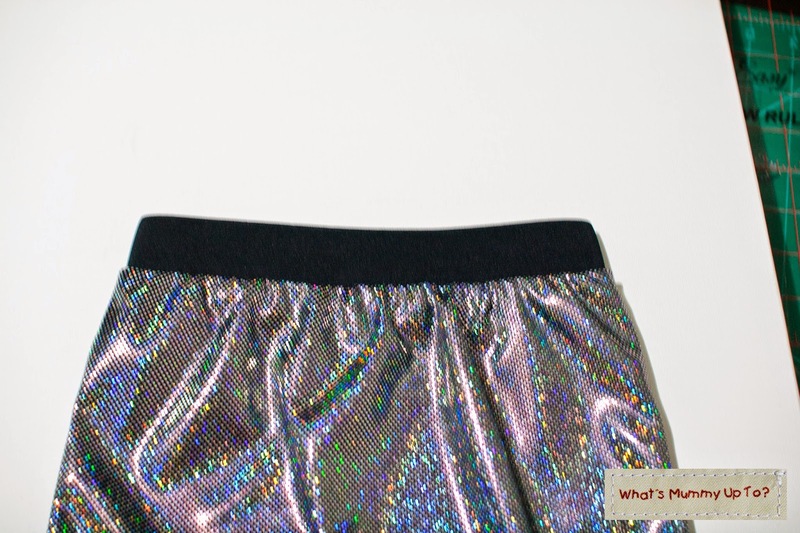 This is how it turned out, and Bethany was so excited to have a "sparkly" skirt. It's getting a little chilly here in Sydney now, and on the day of the party it was absolutely freezing, so we coupled the skirt with some tights and boots, and a long-sleeve tee. Photo-shoot day was a little warmer, so we ditched the tights and added a short-sleeve tee. I think it works both ways. Anyway, seeing as this was such a simple yet effective design, I thought I'd share in case you want to make one too. 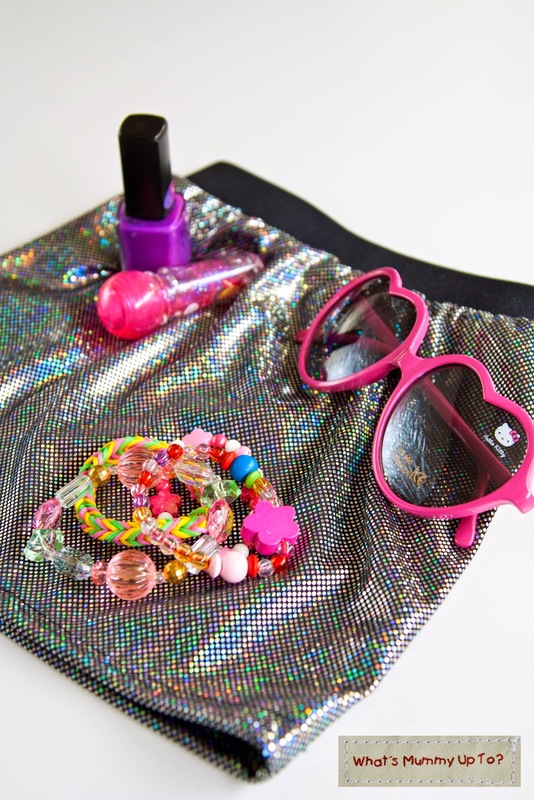 Oh, and I made an extra Disco Diva Skirt so that I could take pics for this tutorial. This one's approximately a size 2/2T (it fits Hannah) for a waist size of 16 1/2". Do you want it? 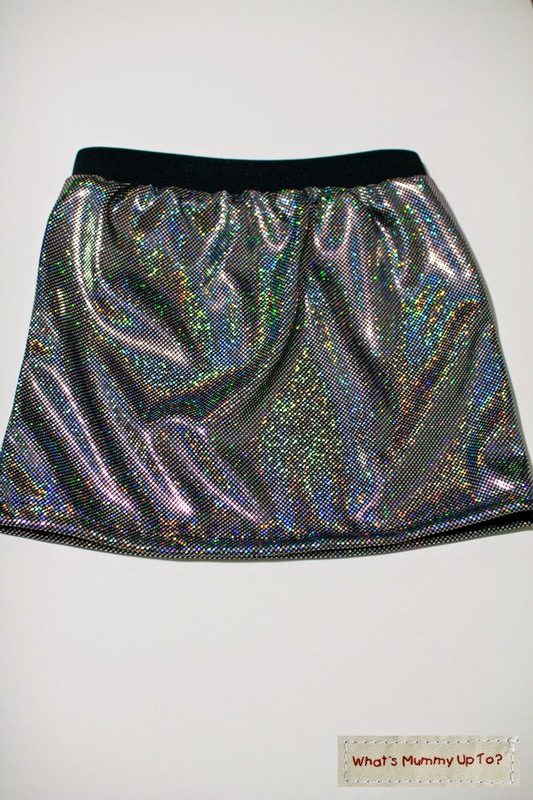 There's only one, so first in gets it ... Take a look at My Shop for a bargain Disco Diva Skirt for the little Diva in your life. 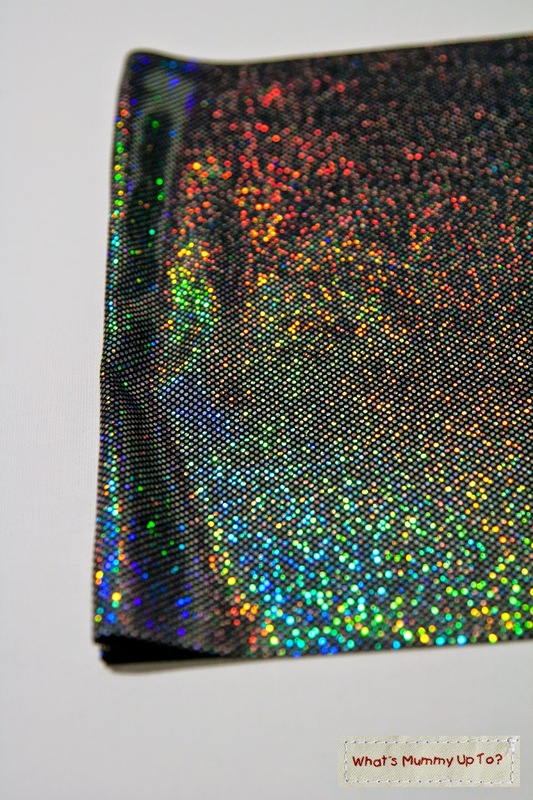 - 1/2 metre / yard "sparkly" fabric - check out the "dance fabric" section of your local fabric shop or online to see what you can find. Try to get one that's a little stretchy in one or both directions. - 1 1/2" elastic - enough to fit your munchkin's waist, plus another inch for joining. 1. Measure your munchkin's waist - Bethany, who's 6, has a waist measurement of 22". Multiply this figure by 1.5. So for Bethany, it is 33". 2. Measure the length from your munchkin's waist (where you want the skirt to sit) to the bottom of the knee - for Bethany this is 14". No need to add any extra length for seam allowance or hem, because the elastic will add some length. 3. Cut your fabric, (with the stretch running horizontally across the skirt) into a rectangle measuring (Waist x 1.5) x length. So for Bethany, the rectangle was 33" x 14", with the stretch running horizontally across the long edge. The fold this rectangle in half, with and cut to make a front and a back piece like so. 4. Place your front and back pieces right side together and sew down each side seam, using a 1/4" seam allowance. If you like, you can finish the raw edge with your overlocker (serger). It's not necessary for non-fraying fabrics, but if you're like me and love to use your overlocker, go for it!! 5. Decide which is the bottom of the skirt ... it won't matter if your fabric print is non-directional like mine. Turn a 1/2" hem, then turn another 1/2" and pin all the way around. Sew the hem around. If your fabric is super stretchy, you might want to use a twin-needle, or even use a zig-zag stitch. I didn't think mine was stretchy enough to need that, so just went with my normal straight stitch ... there's been no issues with the hem so far, so I think that choice was OK for this particular fabric. 6. Now, cut your elastic to the waist measurement plus 1". For Bethany's this was 22"+1=23". Join your elastic to form a circle like so. I folded each end of the elastic under 1/4", then tucked in to each other ... hopefully this photo is clear-ish - then I simply sewed, using my machine, 2 rows of stitching through all the layers across the 1 1/2" width to hold it all together. I'm sure there's a million ways of joining this kind of elastic waist-band, so just go with what you know. 7. Once your elastic is joined, measure 4 equal points around, and place a pin in each spot. The grab your skirt pieces and place a pin at each side-seam, and half way along the front and back at the top raw edge. 8. Then, put your skirt piece inside your elastic waistband, and match the raw edge of the skirt top with the top edge of the elastic. Match up the pin markers on your elastic with the ones on your skirt and pin the skirt to the elastic in these spots. 9. Sew around the top edge of the skirt/elastic, using a 1/4" seam allowance, and stretching the elastic gently as you sew so that you make it to the next pin without any gathers. 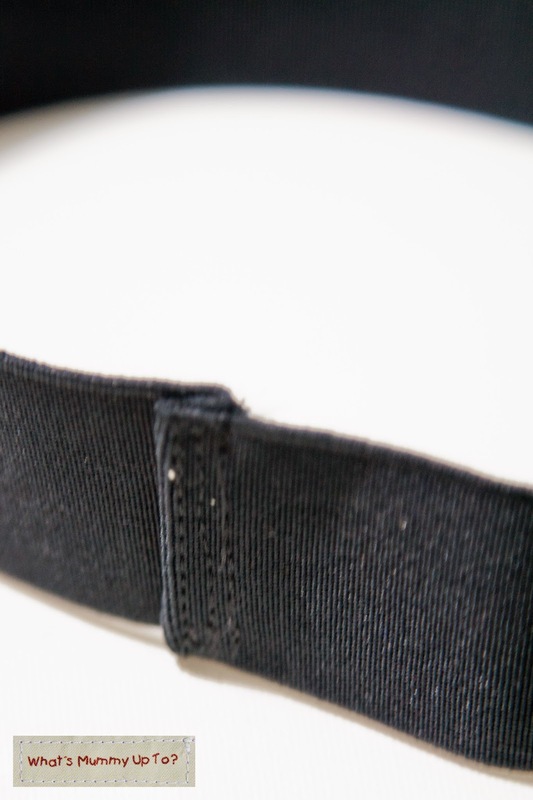 Once you've sewn all around, you'll see that the elastic naturally and evenly gathers the skirt to the waistband. 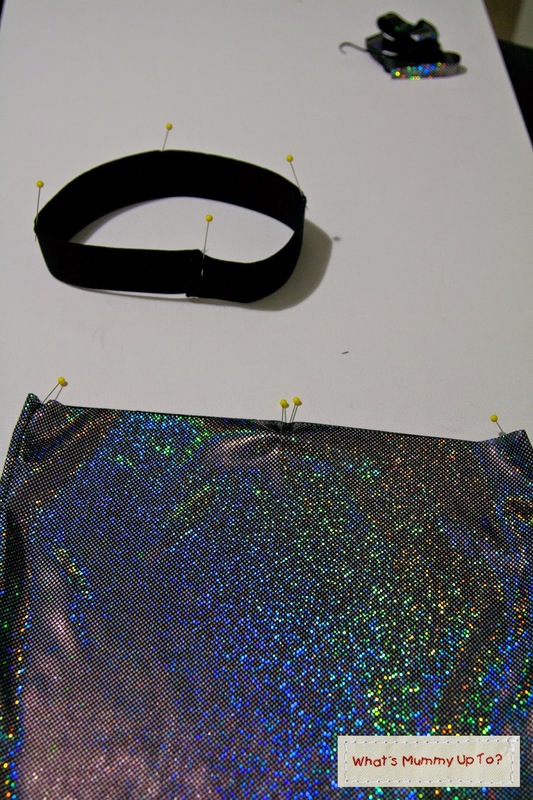 I love this method, and think it's got to be one of the easiest ways to make a skirt! 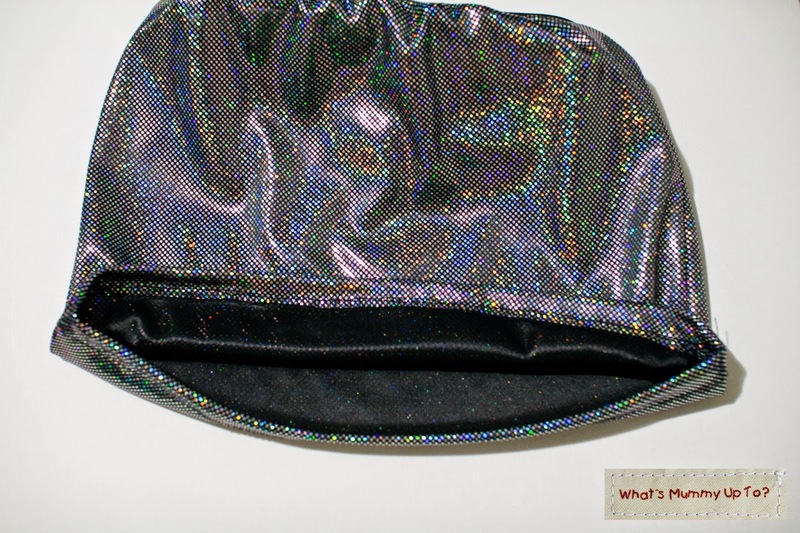 Now, what to do with your left-over sparkly fabric?? ... girls love to sparkle after all. 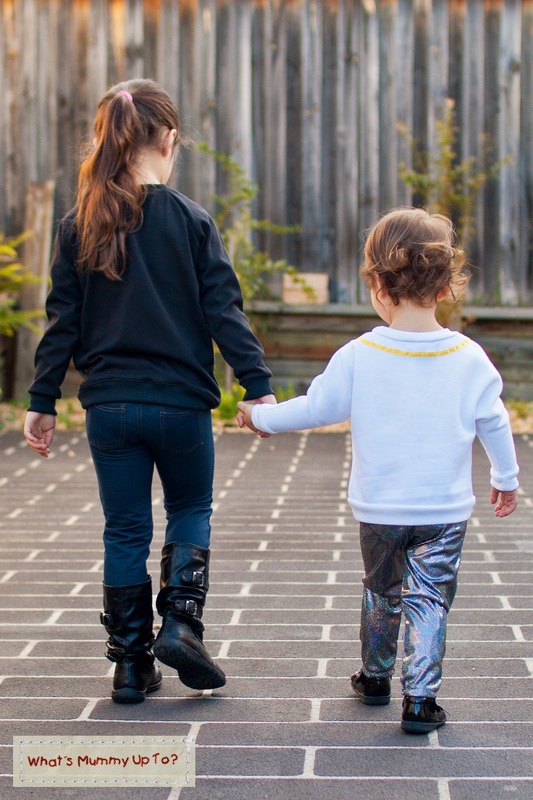 Well, how about my version of the Sequined Raglan Tunic Top from Scattered Thoughts of a Crafty Mom. 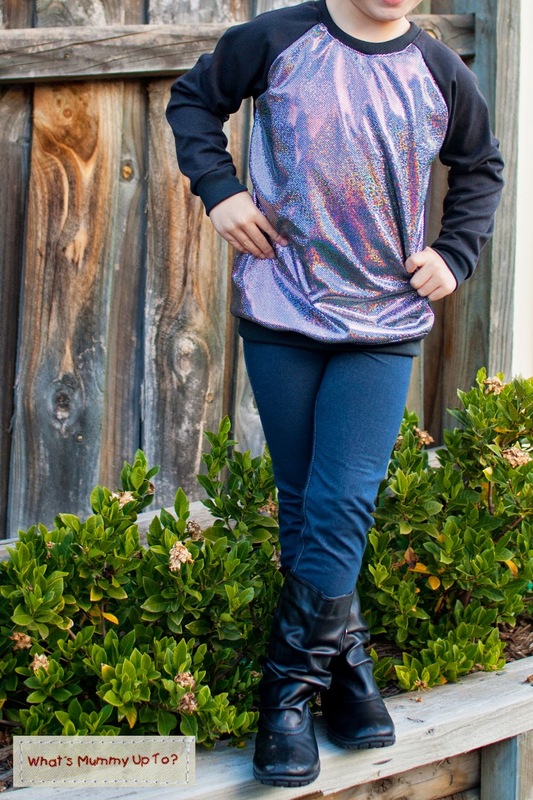 I mean, who doesn't love a free pattern, and this one sewed up so quickly and easily ... Bethany LOVES it, and I think I can see a few more of these tops in my future for this winter ... sparkly or not! 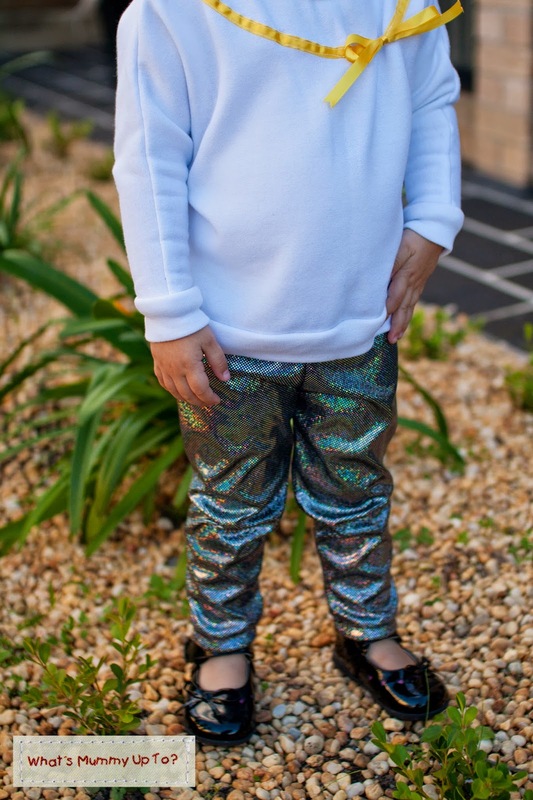 Or, maybe some sparkly leggings ... Too cute for words. I made these in the same way I made my Sweat Pant Leggings last winter, except just turned a basic hem instead of adding a cuff. 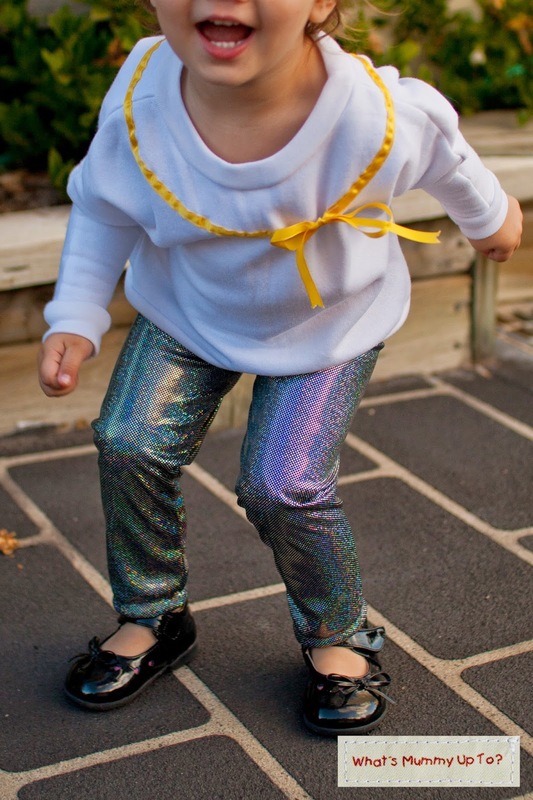 Hannah was "Jumping, Jumping" for these photos ... she loves her "sparkly pants". Someone tell me how to pause time ... this one is growing up WAAAAAY too fast at the moment! Anyway, hope you enjoy your Disco-Diva project as much as I did. 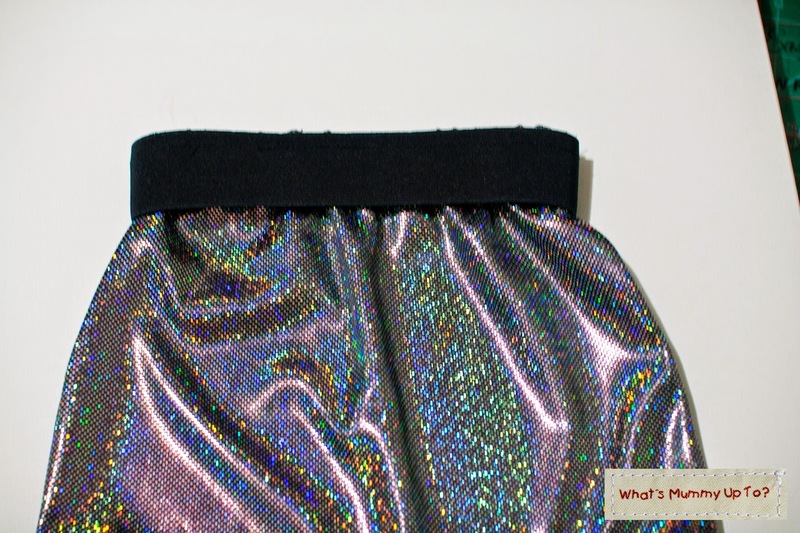 I'd love to see your creations if you make a skirt, or even some cute leggings like these .... email me a pic if you like! OMG! where did you get that fabric???? The fabric is pretty cool, huh! I just picked it up at my local fabric store (Spotlight). It was in the dance costumes section, and is a lycra stretch fabric.